The Philadelphia 76ers had a season to forget, but there were several bright lights amongst the darkness and they are in a prime position to add elite talent come draft night. 82 games later, and the answer is pretty clear: very bad. Although they didn’t finish with the league’s worst record, ending the season at 19-61 (four games better than the Milwaukee Bucks), Philadelphia was arguably the worst team in the league after the trade deadline. After jettisoning Spencer Hawes and Evan Turner (Philly’s leading rebounder and second-best scorer respectively) at the trade deadline, the Sixers went 4-22 for the remainder of the season. They also tied the NBA record for most consecutive losses during the season after falling short 26 games in a row from early February to late March. 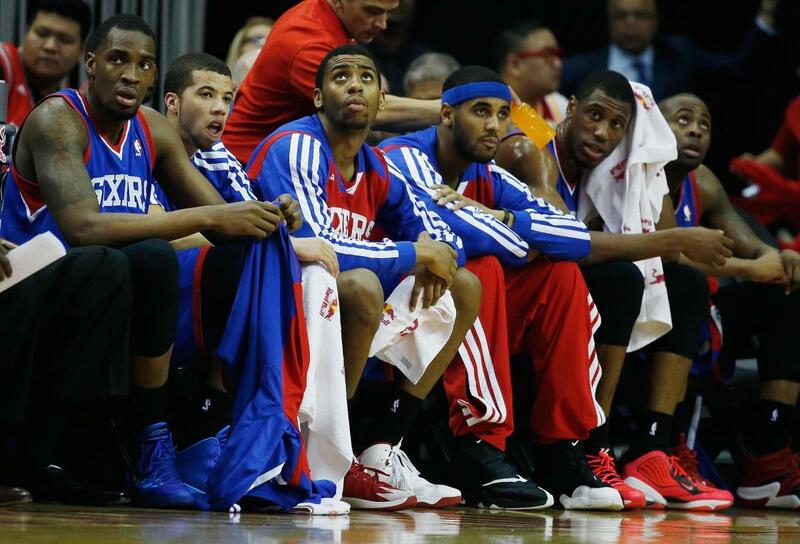 Before the season, Philadelphia had to scramble to assemble an eligible roster. In the end, they rolled out a team well below NBA standard, with 23 different players suiting up for the team throughout the season. Players like James Anderson (28.9 minutes, 10.1 points and 3.8 rebounds per game), Henry Sims (27.2 minutes, 11.8 points and 7.0 rebounds) and Hollis Thompson (22.6 minutes and 6.0 points) were all forced to play bigger roles than their talents could accommodate due to the lack of talent on the roster. After a season to forget, Philadelphia finished the year dead last in points allowed (109.9) and offensive rating (99.4). They struggled shooting the ball all season, hitting only 43.5% of their field goal attempts as a team (29th in the league). Meanwhile, they were incapable of stopping their opposition from scoring at the other end, giving up the third-most field goals and second-most three-point field goals in the league for the season. They also struggled cleaning the glass, giving away the second-most total rebounds in the league. 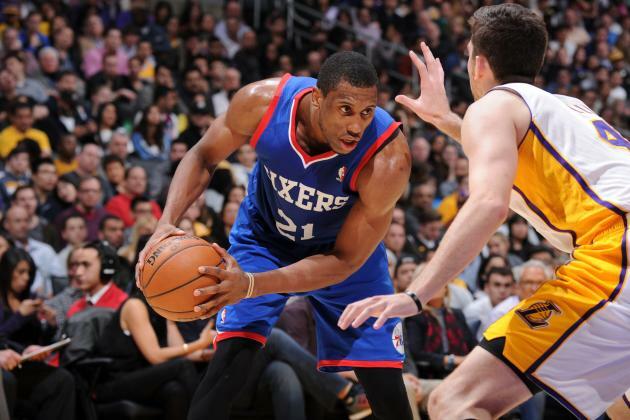 After surviving the midseason exodus of experienced players, forward Thaddeus Young became the Sixers’ sole veteran presence on the roster. Usually a 25-year-old on an NBA team is one of the team’s younger players, but in the case of Young, he was the third-oldest player on Philadelphia’s roster after Hawes was dealt to Cleveland. And with eight rookies, five second year players and five players between their third and fifth season in the league, Young was easily the team’s most experienced player in his seventh professional season. For the most part, Young performed valiantly for the struggling Sixers. He finished the season their leader in points (17.9) and steals (2.1) per game, while he was also third in rebounding (6.0) for the year. His field goal percentage took a hit, dropping from 53.1% to 45.4%, but given his increased role – 3.6 more shots per game and a 4.3% increase in usage rate – and the fact he had to face the opposition’s best defender each night, it is hard to fault him there. Meanwhile, he did regain his shooting touch from deep, nailing 30.8% of his attempts from beyond the arc – the first time he shot above 30% from downtown in four seasons. Young’s future with the franchise is uncertain. Such an experienced and talented player may not be welcome to the idea of being part of a rebuild, and the 76ers might head in a different direction on draft night. But, in one of Philadelphia’s darkest seasons, Young was their brightest light. 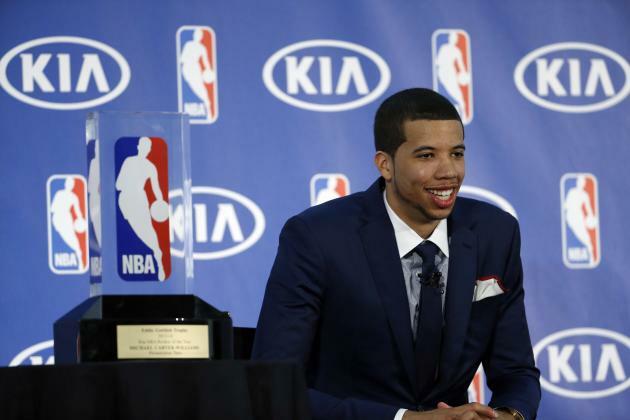 After being overlooked by 10 other teams on draft night, Michael Carter-Williams streaked away with the Rookie of the Year, receiving 104 of a possible 124 first-placed votes for the award. He burst onto the scene with a 22-point, 12-assist and nine-steal performance against the reigning champion Miami Heat in his debut match. Although his season experienced several slumps and rough patches, Carter-Williams finished the season leading all rookies in points (16.7), assists (6.3), rebounds (6.2), steals (1.9), double-doubles (16) and triple-doubles (2). His numbers were obviously inflated by the enormous workload he was handed in Philadelphia. MCW led all rookies with 34.5 minutes per game, and despite missing 10 games, he finished second in total minutes played with 2412 for the season – only 73 less than rookie leader Victor Oladipo (who played 10 more games than Carter-Williams) and 152 more than the third-placed Trey Burke (also played 70 games). MCW could also stand to work on his jump shooting – he finished the year shooting 40.5% from the floor and 26.4% from deep. Regardless, Carter-Williams is clearly the point guard of the future in Philadelphia and it will be interesting to watch his development as the team around him hopefully grows as he does. Philly entered the draft lottery with a 19.9% chance of landing the first overall selection – the second-best in the association – but just like they did to seven other teams, the Cleveland Cavaliers (aka the luckiest team in professional sports) ruined the 76ers plans. However, despite lucking out on first overall, Philadelphia received a second lottery pick (10th overall) via the New Orleans Pelicans thanks to the Jrue Holiday/Nerlens Noel trade from draft day last season. Picking third overall still put Philadelphia in position to land one of the big names in the 2014 draft – Joel Embiid, Andrew Wiggins or Jabari Parker – and give them some of the star power they desperately lacked last season. 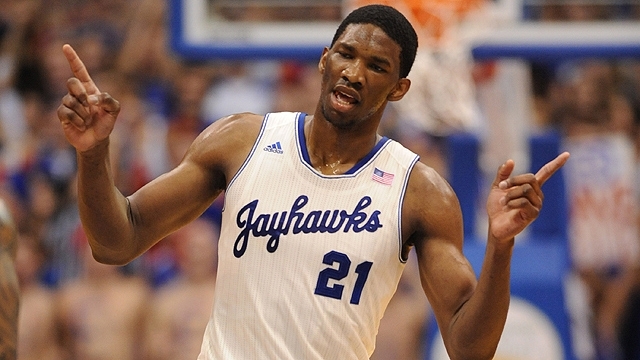 Wiggins and Parker went to Cleveland and the Milwaukee Bucks, respectively, which left Philadelphia to snap up Embiid. Early predictions had the Kansas freshman centre as a heavy favourite to be the first overall selection. However, just before the draft, it was revealed he had a stress fracture that required surgery in his right foot, which would keep him off the court for 5-8 months, and he subsequently slid down draft boards as concerns about his long-term durability began to swirl. However, Philadelphia are not concerned with improving immediately and were not deterred by the likely delayed start to Embiid’s NBA career. Likewise, the Sixers selected Croatian forward Dario Saric with their second lottery pick (after trading pick 10 to the Orlando Magic for pick 12, a 2017 first-round pick and a 2015 second-rounder) despite his contract with Turkish club, Anadolu Efes, preventing him from making his NBA debut for at least two more years. It might be a while before Philly fans get to see their newest additions play, but the wait will hopefully be worthwhile. Embiid, who averaged 11.2 points, 8.1 rebounds and 2.6 blocks per night for the Jayhawks, could potentially be the best player in the drat, while Saric (12.9 points and 9.7 rebounds last season) should be NBA-ready by the time he joins the team. Next season, the Sixers only have $26.9 million in committed salary and if veterans Jason Richardson and Byron Mullen opt out of their player options for next season, it will leave Philadelphia with $40 million in cap space to work with. However, the 76ers might hold on making a run at any big names players just yet. Another season of experience for their young players and some more lottery picks next season would help set them up for the future as much as a big free agent could and at a heavily discounted price. That being said, a move to bring in a cheap veteran backup point guard would help ease the burden on Carter-Williams’ young shoulders. Philadelphia’s situation is not something that can be turned around in a heartbeat, but their controversial roster management leaves them with plenty of tools to fix their broken roster.